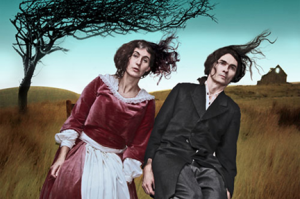 Yorkshire’s most famous siblings get a surreal reimagining in ‘We Are Bronte’ by Publick Transport Theatre. Two performers get under the skin of the Bronte sisters, and scrape away at the ideas of repression and madness that fill their novels. Morecambe and Wise meets David Lynch in this madcap reimagining of the Brontë myth, presented in Publick Transport’s playful and irreverent style. Taking the real and fictitious worlds of Yorkshire’s literary siblings as their inspiration, two performers combine rigorous physical theatre with anarchic comedy to deconstruct not only gothic themes of love, madness and revenge, but also themselves. Created and performed by Angus Barr and Sarah Corbett; directed by Ed Rapley; dramaturgy by Susie Donkin; additional performance and movement direction by Brenda Waite. Company members have trained with Philippe Gaulier and LISPA /Jacques Lecoq and between them have worked with Ridiculusmus, Clod Ensemble, Gonzo Moose, Desperate Men, Spitz & Co, DotComedy, Spymonkey, John Nicholson (Peepolykus) and Punchdrunk amongst others. We Are Brontë comes to The Atkinson on Thursday 5 October at 7.30pm. Tickets are £11 / £9 concessions.